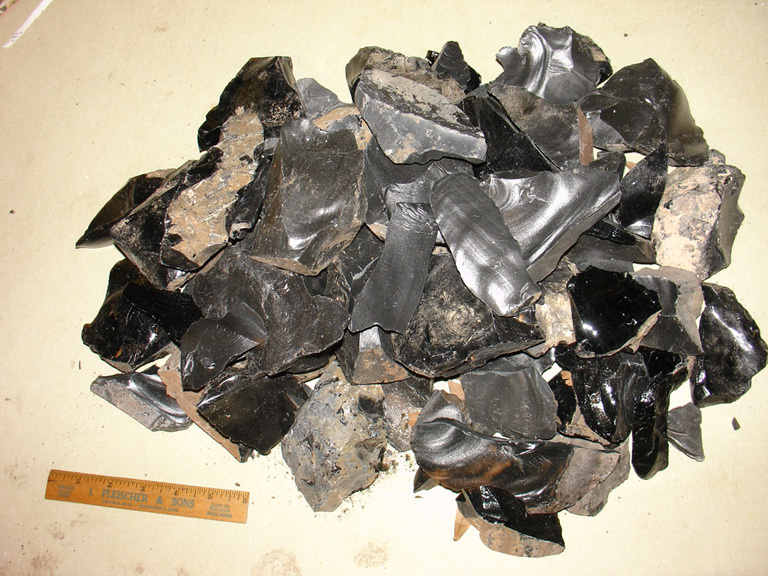 Practice arrow point making with this box of chunks and chips of obsidian and dacite mixed. This material is not the spall mix we sell otherwise, but is a collection of thick and odd shapes and pieces. This material provides practice in the valuable skill of being able to take odd sizes and shapes and trim into usable preforms and finished items. Use an aluminum or small antler billet to practice making small points for arrows or darts. 20 lbs more or less sent Priority Mail in it's own large flat rate box. * - This offer only good with US Orders that qualify for Domestic Large Flat Rate Box pricing. Others will be charged a surcharge that reflects postage charges. INTERNATIONAL CHARGES VARY -- for instance, Canada/Mexico deliveries would require $57.00 USD for the postpaid package -- for international orders, disregard the total on your invoice and we will adjust your charge in the office before the item is sent. No International COD's please.